Buying kids shoes can be tricky, you want something that will catch and attract their attention but also comfortable, stable enough for wear and tear. Whether you`re looking for gym sneakers, or for just running around, you want quality for your money. 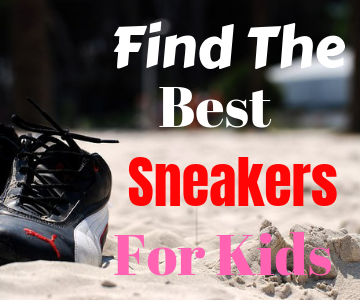 You should always look for support, good fit, and comfort, kids can walk and run miles and this post will help you get it right the first time. 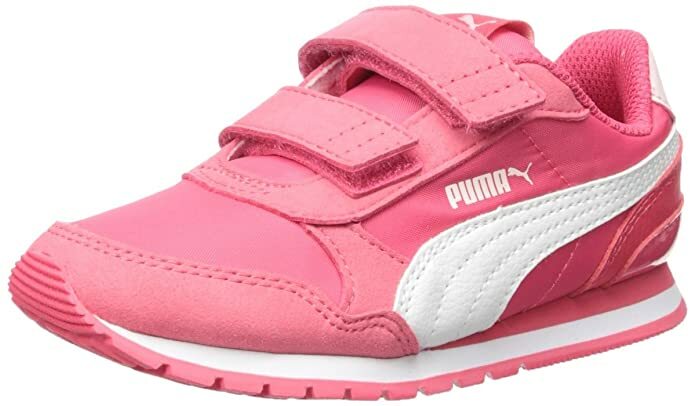 When looking for quality and value for money, PUMA Tune Cat B 2 Velcro Kids Sneaker tops my list and below I will give the details and why you should consider this pair when you want the best sneakers for kids that`s worth purchasing. PUMA is a globally acknowledged athletic brand and is known for its role in the manufacturing of sports, leisure and lifestyle products. A brand that needs no introduction, PUMA came up with a shrunken version of adult sneakers for the kids which is also a part of PUMA’s motorsport collection. Want to read more on Puma history then click here to understand how Puma, as we know it today came to be and their evolution over the years. A leather upper sneaker is a product appreciated and well-liked by the kids for its style and cool looks as nowadays kids know what they like. It is a tri-color sneaker with elastic straps at tongue for easy on and off, stitched in a decorative fashion and has a hook-and-loop closure. The other main features include a removable sock liner, rubber outsole for solid grip and a rounded heel for protection and support. Depending on what you are looking for in kid’s shoes, Puma Tune Cat meets and exceeds expectations from affordability, availability, stability to comfort, these shoe leaves no room for trial and error. Apart from being on the smaller side which happens with many different shoes anyway, there are no cons to speak of really, just order one size larger to avoid miscalculation and be assured of comfy fit. Painful feet in kids because of small shoes is hard to tell as they may not exactly express the pain, it can be something like “I don`t like those shoes” because in their mind they are supposed to like them and can not understand why the shoes feel uncomfortable on their fee. PUMA Tune Cat B 2 Kids Sneaker is for toddlers (1-4 years) and now also in special sizes for children (4-8 years old). But there are larger sizes for older kids like Puma Tune Cat 2. Check this post for other brands of shoes. PUMA products and other sports shoes are easily available online as well as offline shoe stores if there is a sports goods store near you, they might have the shoes or try at your local kid’s shoe store. If you`re shopping online, Amazon has the best offers and depending on where you live, there is free shipping and return policy should you for any reason, not like the shoes or need to change them. Keds presents Hello Kitty Sneakers for the toddlers. Sparkly, bright, and glittery due to the use of twill, sequin and the trimming in hot pink color as per the preferences of the little ones. Along with the attractive looks, a great emphasis is also placed on the comfort, style, and safety of the footwear. Keds Hello Kitty I Heart Kitty H&L sneakers have a low top with hook and loop type closure. The polka dot bow enhances its looks. Keds sneaker comes with a soft padded footbed and collars for added comfort. Maybe you`d like to read hello kitty history here. The durable rubber outsoles are paramount in providing good traction and grip. The textile used in the manufacturing of this sneaker allows sufficient breathability for little feet and keep the feet dry. If you have a child who loves Hello Kitty then this product is for your child. This pair of shoes is good for sporting a casual yet stylish look. Suitable for kids from one to four-year-olds. Apart from style, you have to consider getting appropriate shoes for your child as things like heels don’t just work for kids. 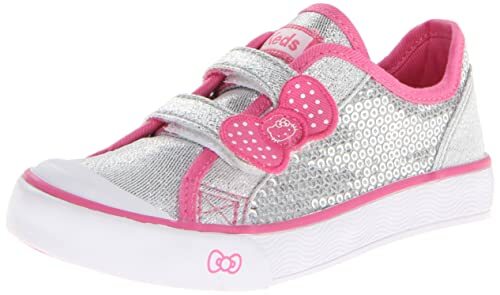 You can purchase Hello Kitty kids sneakers from your local shoe stores or if you purchase online, the best place to buy is Amazon as they have a wide selection.I chose Hello Kitty on this list as this is a real favorite with girls and is also available in waterproof rubber rain boots. (I know this post is for sneakers but….Rolling eyes just couldn`t resist mentioning this). Finding the right fitting and comfortable kids shoes might be tricky with kids unsure if the shoes are comfortable, check the return policy before you purchase should the shoes not fit comfortably. Remember if you`re buying online, you are not able to check the materials so read the description well before you click to buy. PUMA Tune Cat B 2 V Kids Sneaker and Keds Hello Kitty sneaker are two product that will make kids the envy of the others on the playground. They have branded footwear as well as a style icon which receives a number of compliments. Below are more kids shoes to make your shopping online easy, if you have any questions, just leave me a message. If you liked this post, then go ahead and share it on social media so others can benefit from it.